The last time I went fishing I had an revelation. I was sharing the lake with two old guys in a John boat. We were fishing a section of lake that is known for holding catfish. I was keeping a respectable distance from them, about 100 yards. This was far enough to stay out of their way, but close enough to see what they were doing. 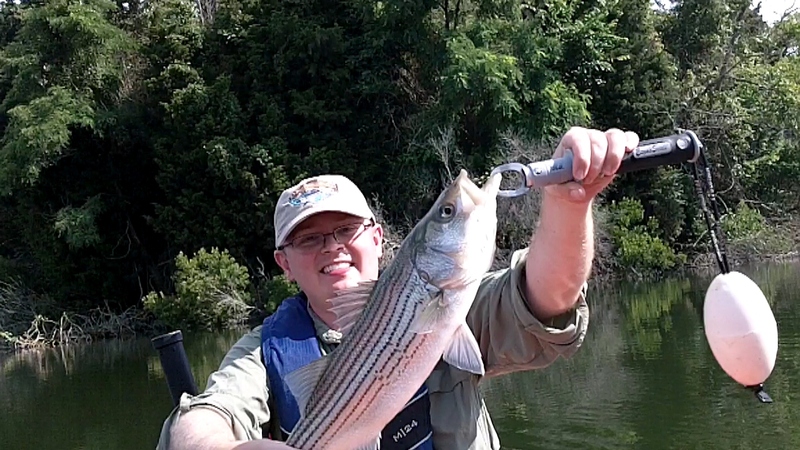 Not that I was paying much attention, the fish were biting with a hit almost every cast. I was vaguely aware that these old guys were not catching anything. Suddenly I heard some cursing and one of the men loudly proclaimed: "If I had expensive stuff like that guy, I would be catching too!" Then they turned their boat around and went home. I don't have expensive stuff. Granted, my gear may have been of a higher quality than theirs, I don't buy fishing gear at Walmart, but I don't use anything outrageous. My favorite line is the $4 stuff from Bass Pro. I wasn't using any fancy live baits like eels or crabs and my fish finder is currently broken. Two of my favorite things. Incidentally, the kayak and poodle cost exactly the same. I do use fluorocarbon leaders, Spro jigs, Gulp! Alive, and a $1000 kayak......they may have a small point. Regardless, I don't think that made a difference this time. It took a few days for me to realize why I was catching more than them. They were bottom fishing cut bait. I was also bottom fishing cut bait on one rod, but with my other I was using a bucktail jig. All of my fish were caught on the bucktail. I got a few bites on the cut bait, but never even hooked a fish with it. This made me realize that every catfish I have caught this year was on a jig. I know, I know this flies in the face of typical cat fishing practices. Catfish love stinky, dead bait. Right? I think that catfish will eat dead bait, but prefer to eat fresh stuff. Catfish are super predators. Every part of their body shows that they were created for it. They have keen eyesight and good hearing. Their ability to smell is almost unsurpassed. They are powerful swimmers with gaping mouths. In many ways, catfish have a lot in common with sharks. When you view them like this it makes sense to fish for them like you would a predator, not a scavenger. 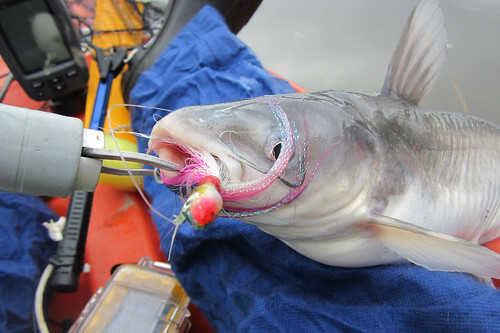 There are a few tricks I have found for targeting catfish with jigs. First is the jig itself. You need a jig with a heavy hook. Many times I have hooked a big catfish with a light hook and had it straighten the hook out. I like bucktails made by Spro and Hurricane. I have never had problems with these two brands. The color of the jig does not seem to matter, but I do believe they need to have a little flash. A flash can make it easier for the fish to home in on your bait. A bucktail alone is not going to catch you much. It needs a trailer. I prefer a piece of Gulp!. All Gulp! types seem to work the same. Good results can be had with shrimp or cut eels too. I believe the action of the jig attracts the catfish and the smell of the trailer makes them bite. I get best results from swimming the jig 3 to 6 feet off the bottom. A slow retrieve is required. You should try and make you jig look like a lost, hurt baitfish. I have tried a quick jigging action, high sweeping jigging, and even a steady retrieve. They all seem to do well one day and poorly the next. Experimentation is key. The hits usually feel like a quick thump, then slack line. Set the hook quickly or you will loose the fish. I think they are following the jig, open their mouth to take it, and then just keep swimming. One thing of note when trying this tactic: I usually catch a lot of fish in the 2 - 10 pound range, but nothing huge. If you are trophy hunting, you should probably stick with traditional methods. 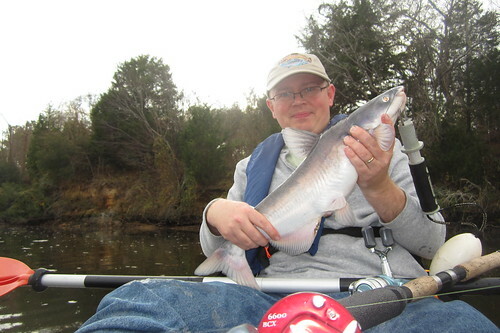 The biggest thing I like about using jigs for catfish is that I often catch other species of fish. Bass, pickerel, and who-knows-what can join the fray!